UR was one of the earliest human settlements (city) in "the fertile crescent". It is also a prefix that you use to suggest something in its early stage of development, like proto — the dictionary says "UR- comb. form. forming words with the sense of 'primitive, original, earliest'. 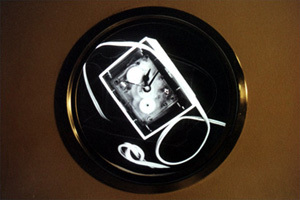 ( ) UR is an installation/performance which creates an ambient space that the viewer can occupy and contemplate as it gradually changes over time. The performance creates an unobtrusive environment in which viewer can meditate within the controlled space of the gallery. The work often deals wit the juxtaposition between the outside environment and the inside environment. The piece mixes control and chance using loops and sound created live and ambient sounds and images from outside. 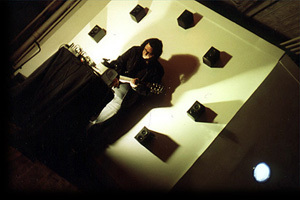 Video and sound loops are mixed in real-time with accompanying guitar and ambient sound from outside. The sound created is somewhere between ambient and noise. 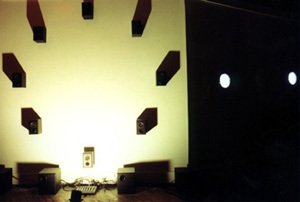 The installation stands alone in the gallery with looping sound and video that is interactive. The viewer can mix the video and sound with a keyboard and mouse in real-time. Untouched, the work will loop continuously where the viewer left off.